I - first inner sphere; II - specimen in which only first two spheres are formed; III - specimen in which third sphere is beginning to form; IV - specimen with three spheres; V - fourth sphere beginning to form; VI adult specimen with fourth sphere very far from third; a pylome is seen, shell broken open; VII - piece of shell with closely adjacent fourth sphere; it is seen that the pores lie in rosettes corresponding to the large pores of the third sphere. 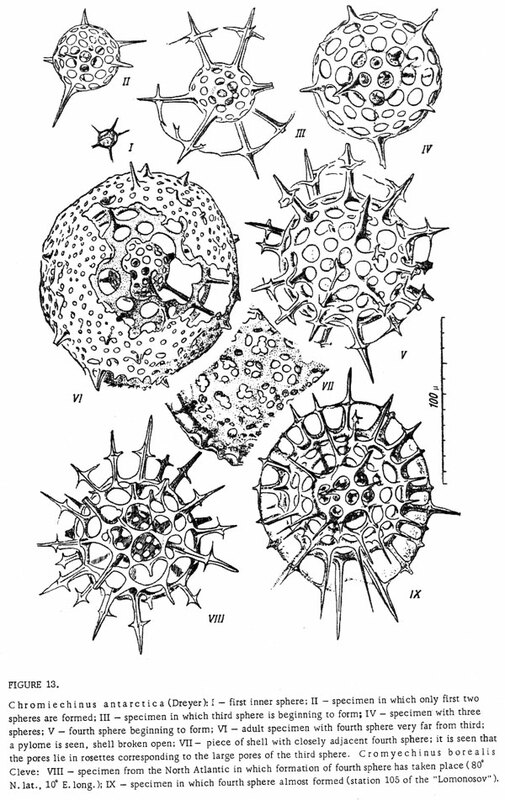 Cromyechinus borea1is Cleve VIII - specimen from the North Atlantic in which formation of fourth sphere has taken place (80° N. lat., 10° E. long. ); IX - specimen in which fourth sphere almost formed (station 105 of the "Lomonosov").